Today I am going to shift focus a bit. I am always torn between covering a topic exhaustively, and offering a breadth of material. I wish to do both. So today i will venture into a different Nation, Latvia. 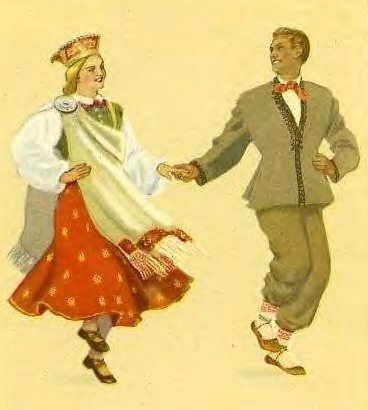 It often happens that one or two particular regional costumes of a nation are effectively used as 'national' costumes, for Poland, Krakow, for Ukraine, Poltava, for Germany, Miesbach Bavarian, for the Netherlands, Vollendam, for Norway, Hardanger, etc. For Latvia, the costumes most commonly presented are those of extreme South Courland, Kurzeme in Latvian. There are three variants of this costume, based around the towns of Rucava, Nica and Barta. Today, I am going to present the Nica version. I am going to assume that you can find Latvia on a map, and in any case, it is easy enough to google. it. Here is a map of Latvia showing the historical province of Courland [which has a fascinating history, btw]. Here is the district of Dienvidkurzeme, or South Courland. 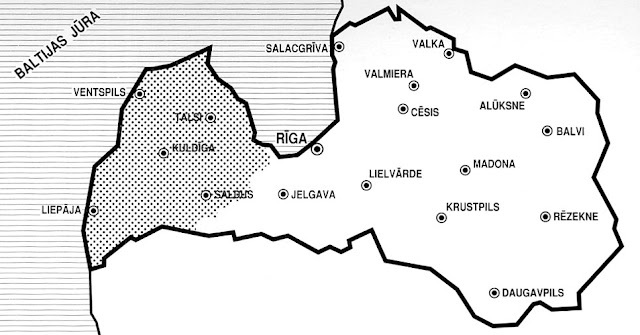 These three towns are all found in the extreme southwest corner of Latvia, Nica about 10 miles south of the city of Liepaja, shown on the map, Rucava further south, about halfway between Nica and the Lithuanian border, and Barta directly east of Nica about another 10 miles. 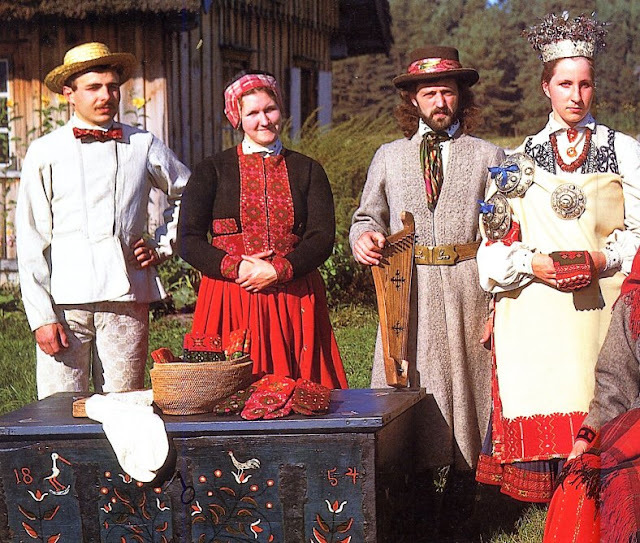 These are not the most typical of Latvian costumes, but one could argue that they are the most colorful and impressive. ﻿Here is a Soviet era print, from a series of the costumes of the 16 Republics. Although inaccurate in some details, this is the Nica Costume. Here are a couple of photographs of people wearing various versions of this costume. 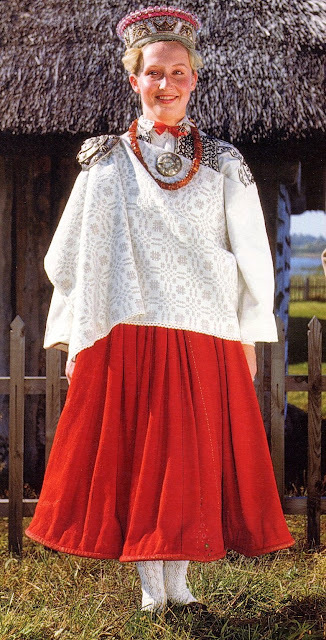 ﻿Now that we have left Tatarstan, the basic piece of the woman's costume is, of course, the chemise, called Krekls in Latvian. Here is the cut. The chemise is embroidered on the collar, cuff, and the shoulder piece. 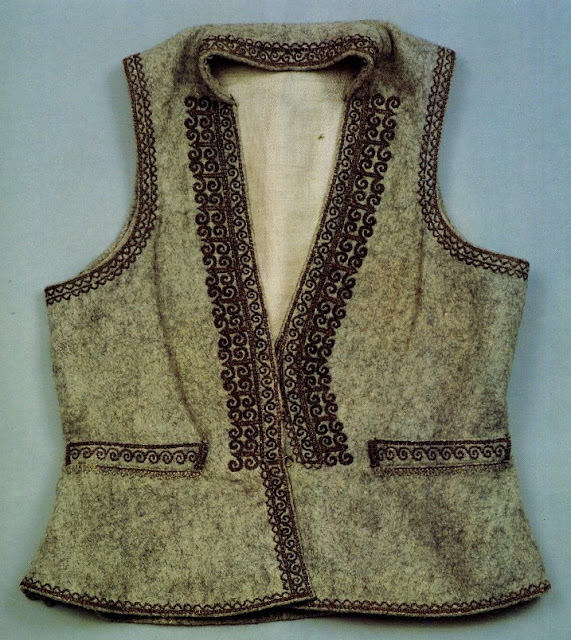 The shoulder is embroidered lengthwise, unlike Ukrainian or Russian chemises. 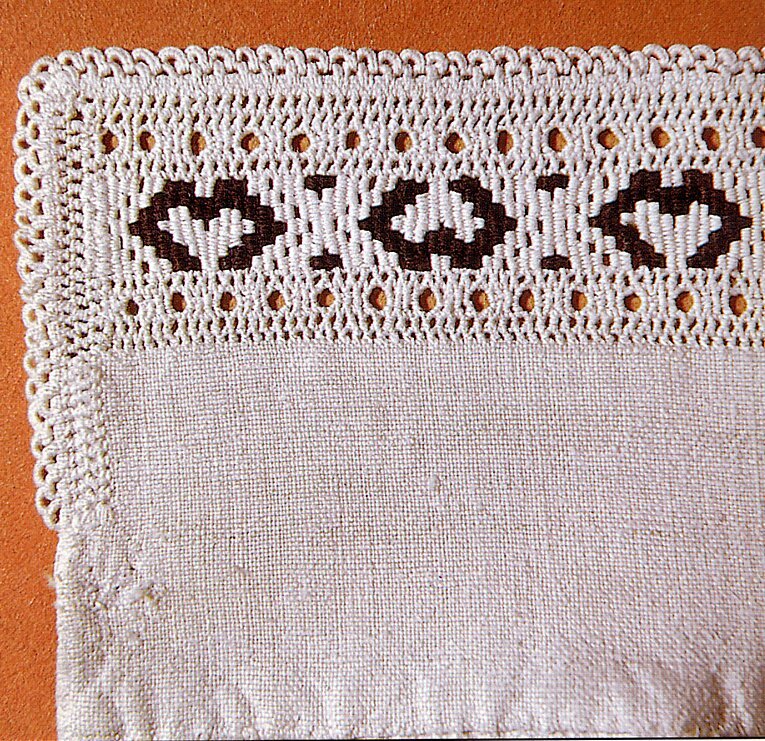 The embroidery is in a combination of white and blue, or white and black, in counted satin stitch, hemstitch, surface stitch and hemstitched loops around the edge. 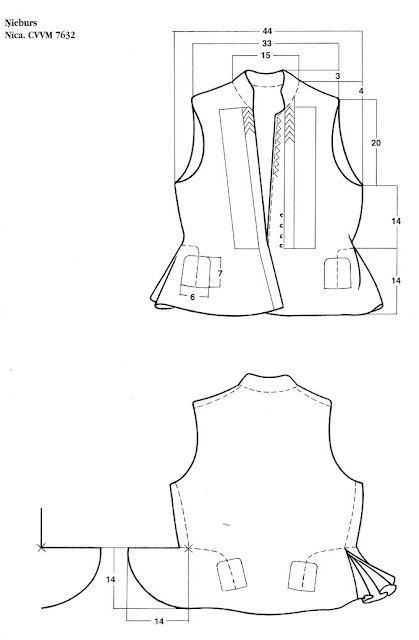 The collar is fold-down. 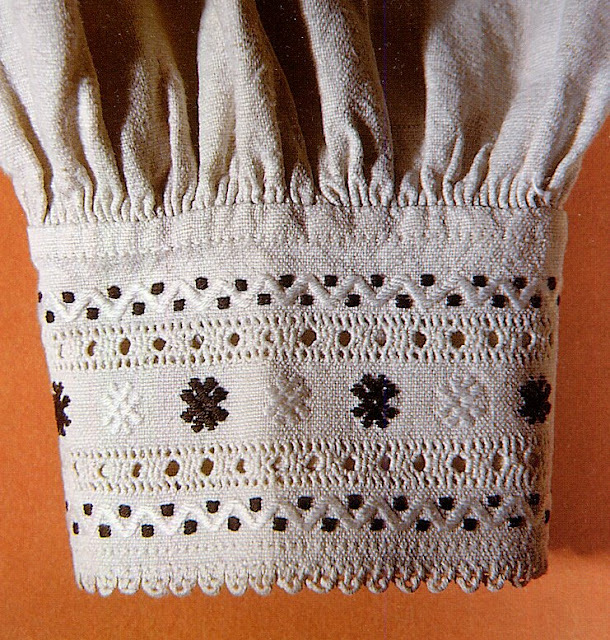 Here is the embroidery of one chemise. Shoulder piece. ﻿There were a couple different kinds of skirts worn in Nica. We have historical records of blue skirts with green, red and yellow stripes with a red hem, but none of these have survived. 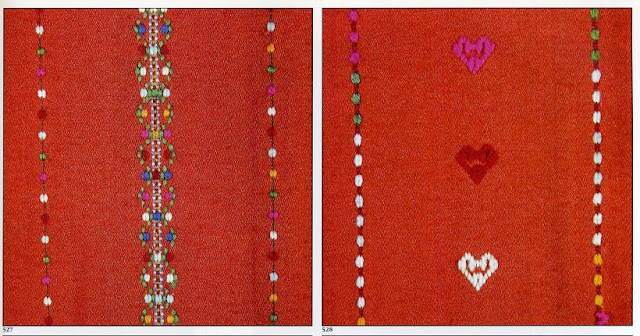 The more festive skirt was woven of linen warp and blue wool weft, with a plain linen band at the hem which was then embroidered with red and other colors. There was a narrow red hem, and it was pleated from top to bottom. The girl in the bridal crown above is wearing this type of skirt, although little of it can be seen. Here is one such skirt. 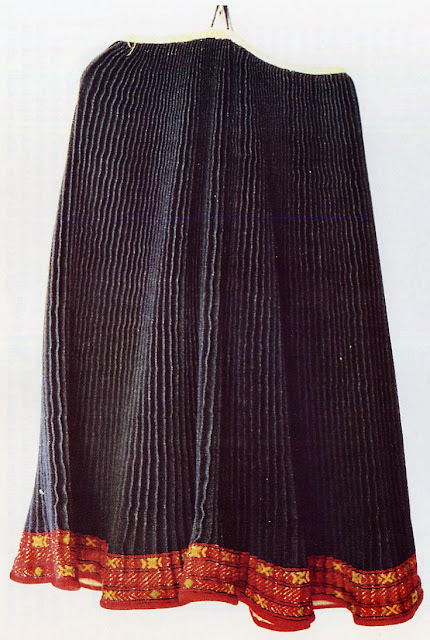 In the 1860's a new type of skirt became popular, and this is now considered to be typical of this region. 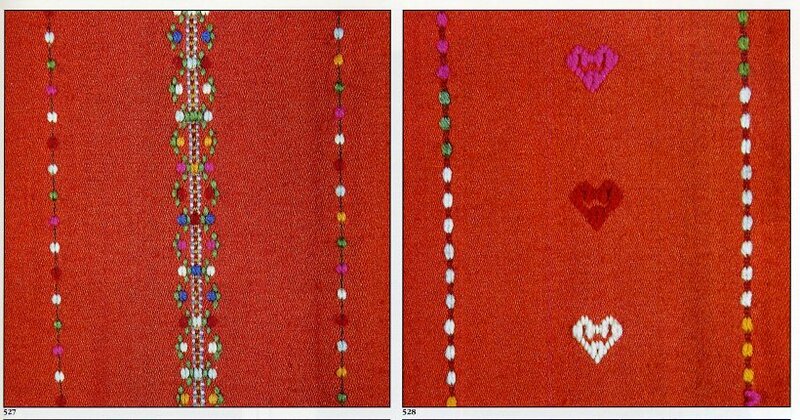 It is an orange red, with darning stitch designs done vertically in lines about 1/2 yard apart. This is the skirt being worn by most of the women above. A thin rope was sewn into the hem, so that it stood out in a bell shape. It was quite full, and finely gathered at the waist. 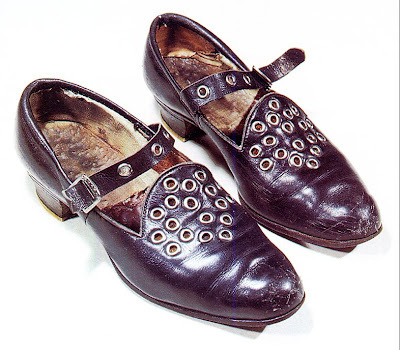 Skirts were worn at mid-calf so as to show off the finely knitted stockings. Here are a couple of examples of the embroidery on this type of skirt. In modern times, these stripes are often placed closer together, and more designs are used on each skirt. The most typical vest of this region can be seen in the above two photos. 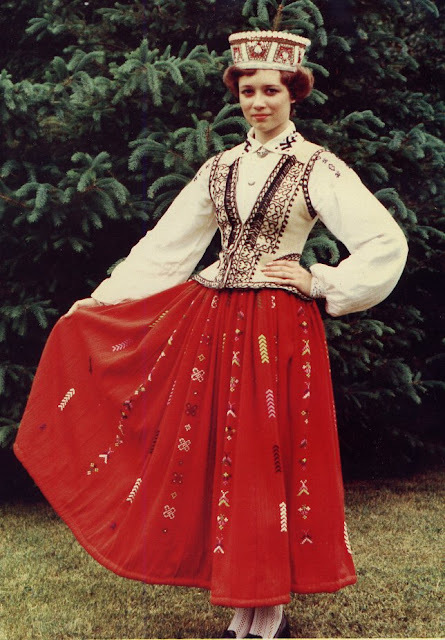 It is called Nieburs, and for the summer costume it is made of a patterned linen twill, and in the winter of a gray wool Either way it is lined with plain woven linen and finely embroidered with double rows of backtich in curved, serpentine designs. 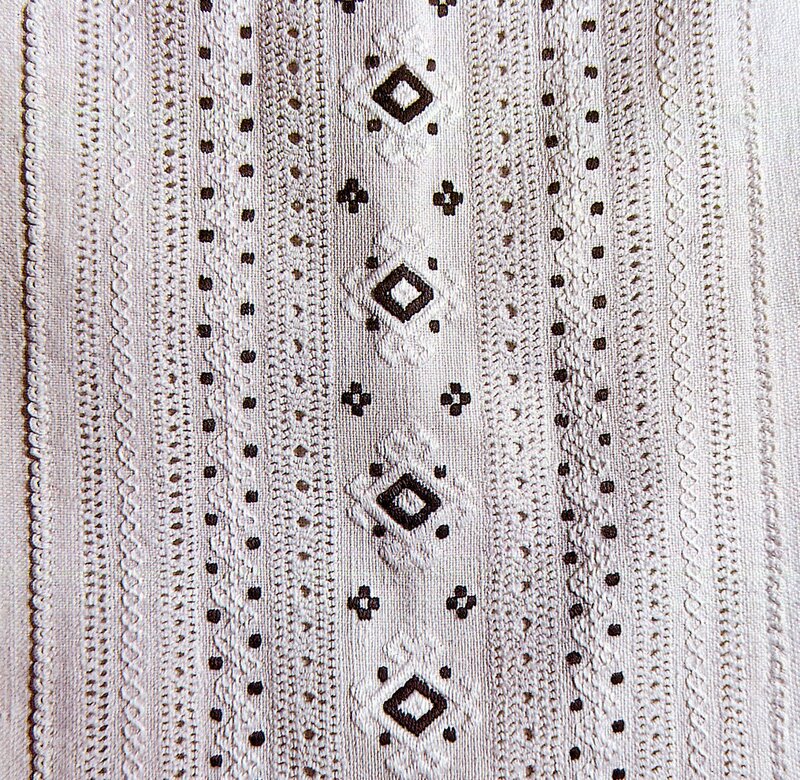 This same type of embroidery is used on men's jackets, and one of my sources claims that the men wore the same vest as well. 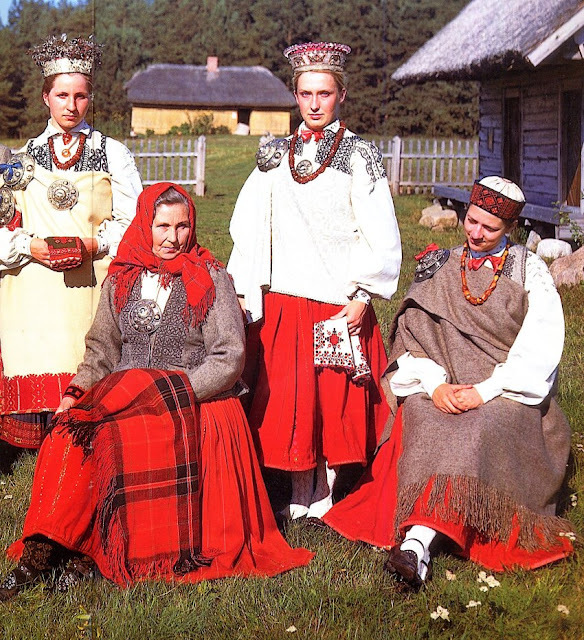 Unmarried girls wore the vainags, the crown-shaped headress so typical of the Baltics. It is made of cardboard covered with cloth, and decorated with gold and silver galloon, seed beads, bugle beads, sequins, and a row of large faceted beads on the brim. 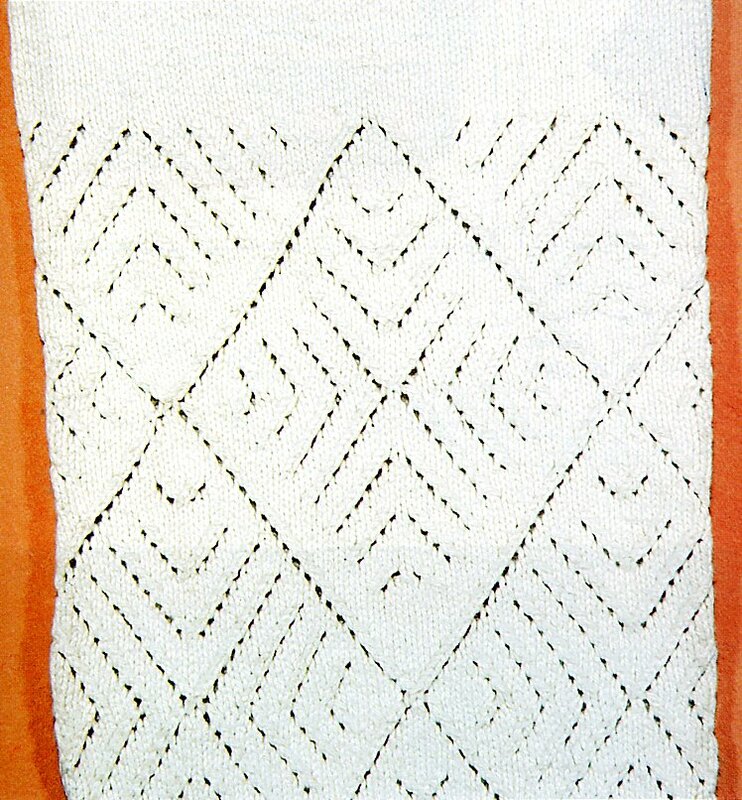 The most defining characteristic of Latvian female costume is the large woolen rectangular shawl, called the Villaine. 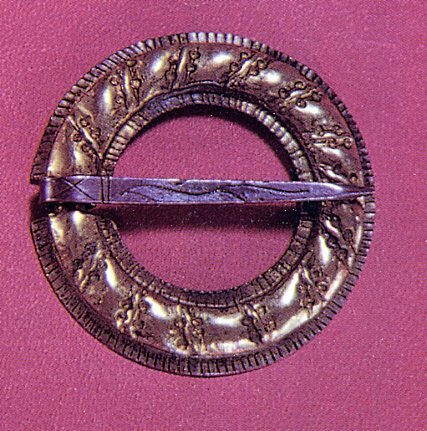 This is pinned closed with a large round brooch, as you can see in the photos above, and sometimes more than one. In this region it was wrapped under the left arm and pinned on the right shoulder. It was usually embroidered around two or four edges, compare the various images above. 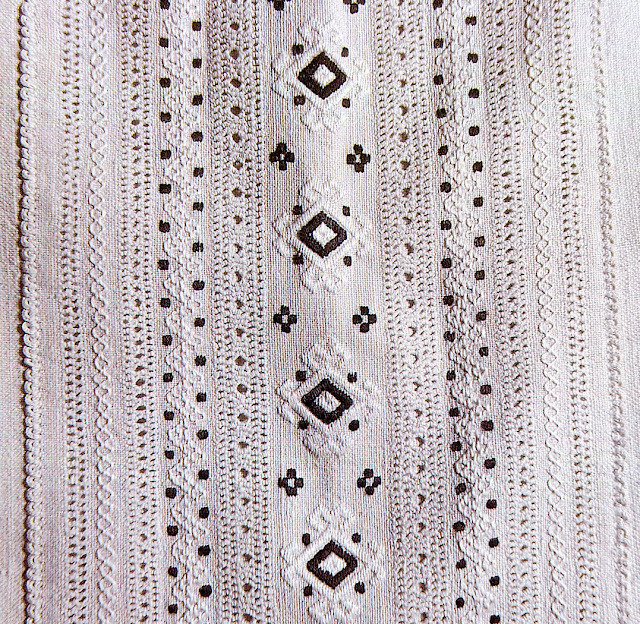 The embroidery varies quite a bit from region to region. Here is a closeup of some embroideries from Nica. 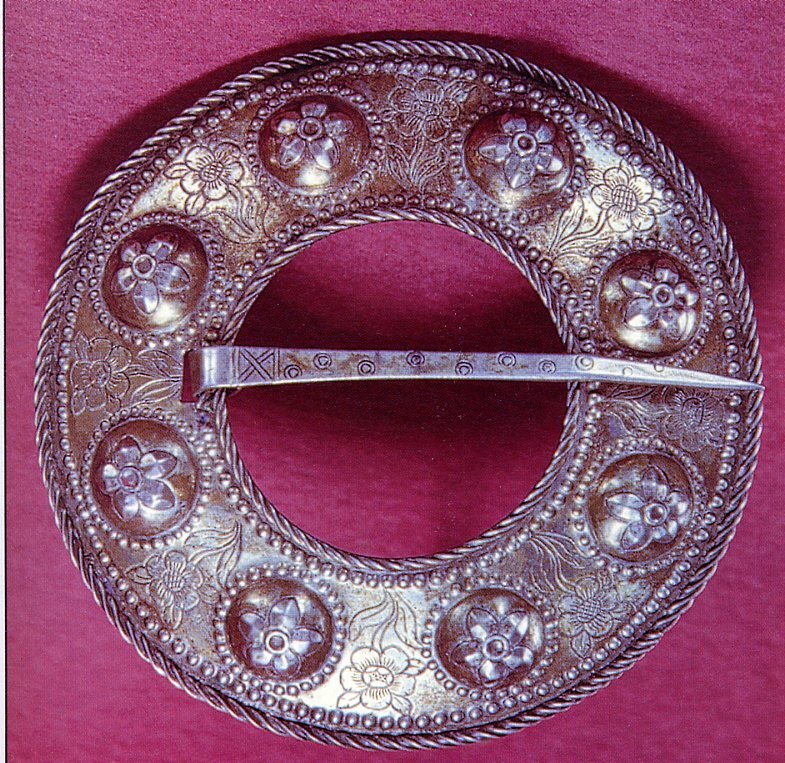 The brooch had 8 'bubbles' on it, and was known as Burbulsakta. Here is a close view of one of them. The chemise is closed with a similar pin, only of course much smaller, either round or heart shaped, of silver or of amber. Necklaces of amber were of course also worn. 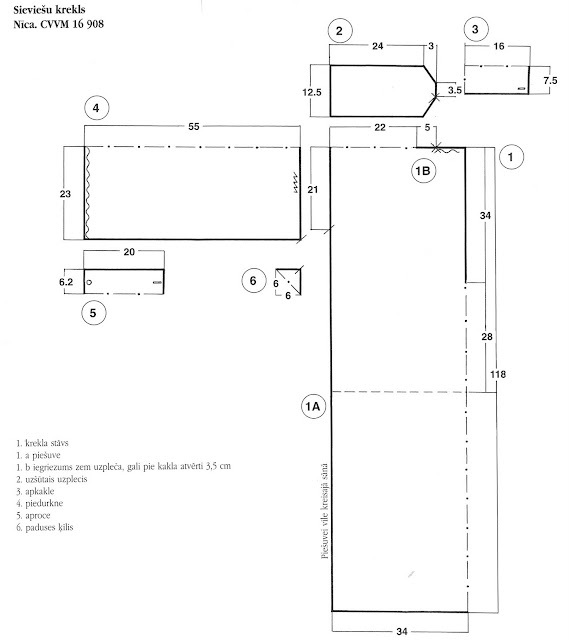 On the right you see an alternative, two buttons joined together, each of which was put through a buttonhole on either side of the chemis opening, and held it closed. This one has engraved dangling amber pieces for decoration. 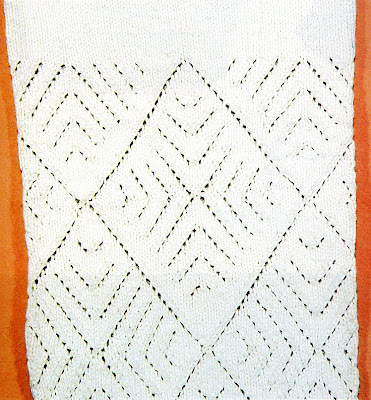 Stockings were finely knit, a solid knit with a design in another color in cool weather, or with an open knitted design in in warmer weather, as in this example. Footwear consisted of Vizes [shoes woven of birch or linden bark], or Pastalas [leather home made moccasins], for either of which see the images in the posting on Men's costumes.In more recent times actual shoes were worn, which in this region were decorated with metal rivets and came in several styles. 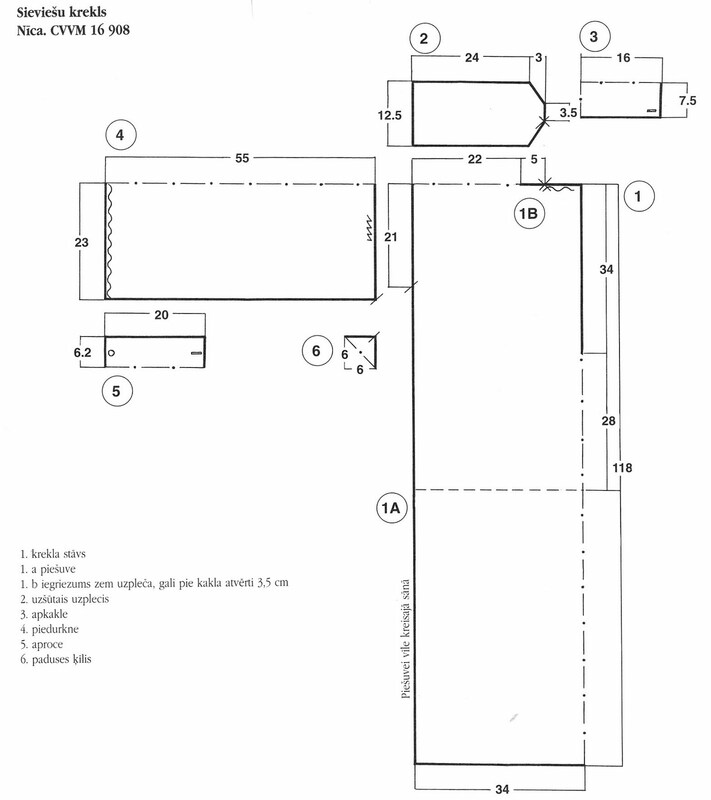 Here is one example. As always, thank you for reading. I hope that you found this interesting and inspiring.